The phone rang, it was friends calling to say they were enroute to our house.They were not expected, but it was going to be a treat to visit with friends we have not had a chance to see during the holidays. The 'back' door bell rang and the kitchen door opened, as our friends expressed their 'specialness' by coming around the back! We love to have friends over and want them to feel welcome in our home. These friends don't mind seeing the way we live, like I said, "They came through the kitchen!" But wait, what is it he is carrying with him? It is an extra special gift. It is 'extra' special because it was handmade by him, every part was cut, screwed and wired together by his hands. Just the creation of it was from him, even the blueprint (there was none!) Inside was a light, the word of God was written on a tag, and the creator had signed his name. This was made for us, for our home. It has a place of honor on our mantel now. We were very touched to receive this gift. This gift has a light inside, with parts of doors that many have walked through, and glass that others have looked through....seeking Him. It was made with recycled materials from our old church, even the old window panes. Christ came for me, giving me the unexpected gift of salvation. I did not realize I was being offered that gift until I was sixteen years of age. He came for you too. Have you received the unexpected gift, the one from Christ? Like this gift we received tonight, it is a gift that gives light that only the Creator can give, but you must receive it. The year is coming to an end, but this could be the beginning of a joyous journey with Him! The movie 'Return to the Hiding Place' will soon be released at the theaters. Corrie ten Boom realized the rising Nazi empire would swallow Holland and she faced this with a surprising remedy: an army comprised of untrained teenagers. Hans Poley, who was a physics student, chose not to join the Nazi party. While hiding in the home of Corrie ten Boom, Hans is drawn into an intricate web of espionage and activities in the famous Hiding Place. The movie is action packed with daring rescues, hijacks of Gestapo, and the miracles of one of history's most famous dramas. It is entwined with the love story of Piet Hartog and Aty van Woreden (Corrie ten Boom's niece). The interweaving thread of the making of this movie, shows the hand of God leading and guiding through the various phases. It is finally ready to be viewed by the audiences, to be blessed in seeing the way God works in the lives of people. The way God continues to work in the lives of people, has always amazed me. He is the same God today as the God of Moses, Isaac, and Abraham, so I should not be amazed. He loved and cared for His people as they roamed through the desert and were in captivity in Egypt. He loved and cared for His people in the Hiding Place, protecting them. He loves and cares for us today, leading and guiding and protecting. The movie, The Return to the Hiding Place, will show the audience how much God cares about His children. There is a breath taking rescue of an entire orphanage of Jewish children marked for mass execution by Hitler's assassins. Does God care any less for us? No, but we need to see Him in all things....the good and the bad. Evil is on this earth and lays in prey for us, waiting on us to fail. 1 Peter 5:8-9 "Be of sober spirit, be on the alert. Your adversary, the devil, prowls around like a roaring lion, seeking someone to devour. But resist him, firm in your faith, knowing that the same experiences of suffering are being accomplished by your brethren who are in the world." Also, as Christians, we need to be mindful of the hard times we all go through at sometime or another. We may not be in 'hiding' for our lives, but we may have other devastating situations in our lives. Let us keep our minds and hearts focused on the One that really matters and lean on Him to get us through. When we realize that we have made it through our valley and have come out of our 'hiding place,' let us be like Hans in the movie....giving God glory. Rachel was raised in a home that attended church faithfully. She was like any other child that grew up in church, acting in church dramas and plays. However, there was one slight exception, her father was the writer of the plays and her mother was the ‘historical’ and artist that designed the period costumes. Rachel said she thought every child grew up in homes full of acting, writing and designing dramas, until she was in her teens. While listening to Rachel share the story of how the movie came about (which I will be sharing in a future writing) shows me that not only her father, but also the cast, was obedient to the Actors Guild and the requirements, as well as to God. A Casting Director was hired and Rachel went through same the procedures as all of the other actors and actresses trying out for the parts. She had the background of many stage plays, including playing Maggie in Tennessee Williams’ Cat on a Hot Tin Roof in Vienna, plays in NY, VA, and Washington DC. The workings of God often are a mystery to us, but seeing Him in the production of a movie could be a new venue for some of us. The social media, television, music and movies are one way that we as Christians can reach out to the non-believers. The word ‘church’ is not a building, but it is those of us that believe, those of us who can spread the Word and the gospel. What better way to share the gospel than through the entertainment media? Not only that, but this movie will challenge us as Christians, to realize that God does work in the lives of the faithful. What is sacrifice? What is boldness? What is faithfulness? Who are we, as we sit and do nothing, while others are dying in their sin? Are we the faithful Christians? Would we stand bold in the confrontation? 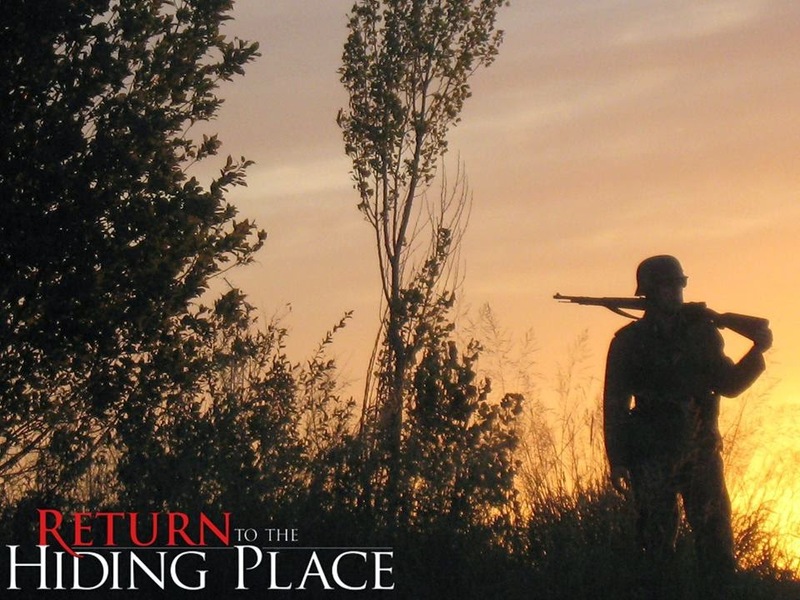 Be sure to watch for the release of ‘Return to the Hiding Place’ movie in Feb, 2015 in a theater near you!Tell your church leaders to request the movie in local theaters! Spread the word!